A man whose body was discovered at a house in rural County Antrim was shot twice, police have said. David Hugh Murphy, 52, was found by a friend at Glenholme Farm on Church Road in Glenwherry on Tuesday afternoon. Police have launched a murder inquiry into what has been described as a "brutal attack". Det Supt Jason Murphy said the motive behind the killing remains unclear, but that the investigation was moving at a "considerable pace". The shotgun used in the attack has not been found. Det Supt Murphy told BBC News NI: "We believe David was shot twice with a shotgun at his house, but the post mortem examination is still ongoing. "David was in his home and believed he was safe in his home and he was entitled to feel that way," he added. "He was known to police and his background will form part of the investigation as we try to establish whether or not [it] is relevant to the murder. "At this stage, it's too early to say." Det Supt Murphy appealed for anyone who was near the victim's house between Saturday afternoon and Tuesday lunchtime to report any information of relevance. "This was not just an attack on David," he said. "It was an attack on his parents and siblings who will have to come to terms with their loss." Forensic investigators were at the scene on Tuesday night. 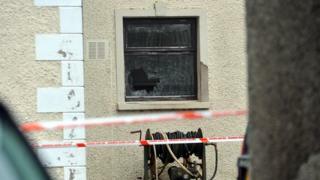 Ian Paisley, the Democratic Unionist Party (DUP) MP for North Antrim, said the murder was "absolutely disgraceful". "This part of my constituency is a very rural, remote and quiet area - a place where people would notice tranquillity, not terrorism. "What has happened here has shattered that silence. "There is no room for gun law in this society - there's nothing justified about a man picking up a gun and taking a man's life no matter what the circumstances are."